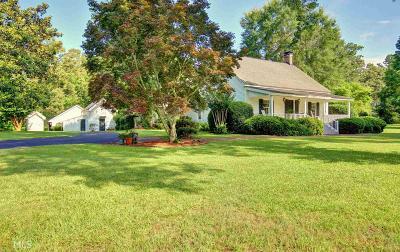 Gorgeous rustic farmhouse on 11.5 acres in Sought after Brooks! Built in 1870 then completely renovated and enlarged to its current stateliness. This home boasts antique floors throughout, central vac, Pella windows, huge country kitchen, upstairs den, original hardwood ceilings, a beautiful pool and outdoor kitchen, barn greenhouse, toolshed, detached garage, and a guesthouse with kitchen and full bath overlooking a landscaped courtyard. Newer HVAC, and all electrical has just been updated and is under service warranty. 45 minutes south of the Atlanta Airport. This is the most charming house in the county and is features in the Rambler- a magazine by the Georgia Trust for Historic Preservation!